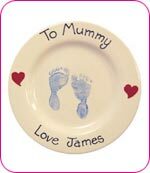 Pottery Painting allows you to capture your baby hand prints, footprints or even your children's artwork on delightful pieces of hand-painted pottery, including; Plates, Mugs, Tiles, Clocks and Photo Frames. Pottery Prints make delightful Gift items for any proud Parent or Grandparent and are perfect gifts for any special occasion, including Birthday's, Christening's, Mothers Day or Father's Day. Many Pottery Prints Artisans also offer children's Birthday Parties where children can participate in their very own Pottery Painting Sessions, creating their own wonderful works of art.